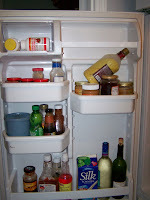 Welcome to a new feature - the Wednesday Fridge Follies! Each Wednesday I clean out my refrigerator (and I use clean in the loosest sense of the term here) and take a picture of everything I end up throwing away. This exercise in public humiliation should make me take a good hard look at the amount of waste in our household and cause me to reevaluate our food storage habits, resulting in a smaller carbon footprint for our family and more food for others to eat. Where was I? So, now, instead of drying up, the baby carrots sort of rot in the water because, the next time I need some baby carrots, I can't find the container in my mess of a refrigerator and open up a new bag instead. The container next to the carrots contains some cut-up scallions that I thriftily saved (in theory, at least) for another meal. At least they made it to the cutting-up stage, unlike their sorry-looking brethren above them. That's 2 bunches of scallions I unearthed from the meat drawer, folks. Looks like I had something yummy planned! Sure wish I knew what it was. Moving on....to the left of the carrots is a glass dish half-full (or you can call it half-empty if you like) of homemade sloppy joes. These are a family favorite, so I cannot figure out why there were any leftovers (unless, of course, this particular container was pushed to the back of my black hole of an icebox and wasn't recovered in time). Atop the sloppy joes is a (you guessed it) gladware container full of peas and rice. I don't even remember what meal this was from. Out it goes! 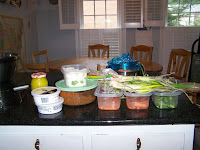 To the left of the sloppy joes are 2 containers of cream cheese. This is curious, as we generally don't allow open containers of dairy products in our refrigerator (due to Theo's milk allergy). We must have treated the kids to bagels and thought the leftover cream cheese was too good to waste (at least, not without letting it go green in our refrigerator first). Yuk. I don't remember when we had bagels, either. 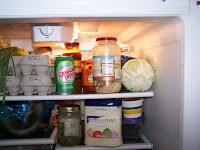 Peeking out from behind the cream cheese is a jar of homemade Italian salad dressing that we made when I had some guests over, which was...let's see....the 4th of July! 3 weeks being the statute of limitations of abandoned homemade dressing (says me), it's time for us to bid arrivederci to this particular item. Besides, we have another jar of it in the fridge. I guess I made too much. There's an interesting story behind that metal bowl. You see, I spent years and years picking up used Tupperware from yard sales and thrift stores; but what I really hoped to find were some stainless steel bowls complete with storage lids. They were the holy grail of my bargain-shopping for over a decade until, finally, a couple of years ago, I admitted defeat. I forked over Larry's hard-earned money for a brand-new set of 3 bowls with lids. I loved those bowls. I admired their shininess, their usefulness (good for cooking and storage! ), and the way they nested so space-savingly in my cupboard. Our relationship was, of course, too good to last. Only 2 months into it the lid for the largest bowl (pictured) went missing. Gone - just like that, leaving a hole in my heart that couldn't be filled. I never found it. Not even when we moved last year and I was sure it would turn up, under the stove or behind the refrigerator. And now, now... the lid to the smallest bowl is gone, also. Off to join its brother, I suppose, wherever plastic storage lids do go, leaving their owners bereft and hopeless and wrestling with recalcitrant saran wrap. But I digress. It's time to stop mourning and move on. Behind all the food is a yellow plate with 1/2 an egg sandwich that Susie left over at lunch. What do you say, folks? Should I wrap it in foil and pretend that someone is going to eat it later and then suffer the embarrassment of taking a picture of it one week from now? Or should I just toss it now? As a parting note, I would like to point to my culinary accomplishment of the week. It's not all rotting food and moldy veggies here, folks. Sometimes something good happens in my kitchen. 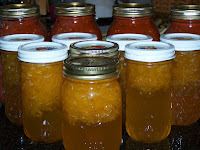 And this week, it was this stuff to the right: 8 jars of homemade peach jam (well, 4 jars of jam and 4 jars of not-quite-jelled peach something-or-other) and 4 quarts of homemade tomato sauce (plus 1/2 a quart which is...um....somewhere in my refrigerator). I don't have a napping kid anymore; Susie is 3 already and if I let her sleep midday, she's up until 10 in the evening. But I've spent over 16 years lying down after lunch with one baby or another, and I've come to require that little siesta for myself. In fact, I get really cranky without it and throw tantrums. I even have a special blankie that I bought at IKEA (a purple throw) that I need to use at nap time. I don't know what I'll do if I ever have to pursue full-time employment - can people nap at work? If there is one thing that raising kids has done for me, it has given me an abiding appreciation for sleep. Aaaah! Isn't that a pretty word? Sleeeeeep. I just loooove the feel of a cool pillowcase against my cheek. Is this weird? Tell me if it's weird. Then I'll know not to mention my addiction to anyone in real life. It will be our little secret. And I'll train the kids to say, "Mommy's upstairs ironing" when neighbors come knocking on our door midday. No, no one would believe that. How about "Mommy's upstairs cleaning the bathroom"? Forget it, serious credibility issues there, too. I need an alibi for my afternoon snooze! Anybody got one? G-rated, of course...we don't need the neighbors laughing at us again. It's not too late to comment on yesterday's post and be eligible to win Leave The Building Quickly! I didn't begin to do this book justice yesterday. It stands up well to a second reading, and is chockful (sp?) of a variety of semi-insane observations and analogies that catch you by surprise. (Well, they catch me by surprise, anyway - maybe I'm slow.) The essays range all over the place, from her beloved grandmother's Alzheimers to her son's fear of fire alarms to her brush with a life-threatening disease. And it's all funny! Don't you find senile old people and traumatized children and near-death experiences amusing? No? Well, you will, after you read this book. I don't know how she does that. I can't believe none of you caught it, but there was a fourth bottle of salsa on the refrigerator door last week. I just noticed it yesterday. This whole exercise in cold storage investigation is starting to remind me of those picture games in Highlights magazines. You know, the ones where they ask, "Can you find 15 [whatever] in this picture?" 4 bottles of opened salsa. Sometimes, I amaze even myself. Well, it's taken over 16 years; but I finally had to take a kid to be fitted for eyeglasses today. I'd begrudge Theo the expense, but he never did require braces; so I'm still getting off fairly inexpensively with him, I believe. Also, he only required 10 minutes to pick out a set of frames. A teen girl (any teen girl) would have required at least 3 hours of agonizing deliberation before settling on a pair of frames that she would later claim she "looks ugly" in. Larry has persuaded me to try a family camping trip (tent, no camper for us) for a few days this month with all the kids. I only agreed for 2 reasons: we can't afford anything else, what with fun items like root canals and eyeglasses clamoring for a piece of the household-income pie; and we're making Anna come along, which should provide quite a bit of amusement. Well, 3 reasons, actually; let's face it, the trip will be fun to blog about. Only, I don't have a laptop to take along. And I strongly suspect that buying one for the occasion would negate any money-saving aspects of this particular family vacation. So I'll just have to take copious notes. Or maybe there will be a public library with internet access that I can sneak into from time to time. Air-conditioned, of course. Rules are as always: Leave a comment telling me you are interested in the book. The winner gets to review the book on his/her blog and then pass it on to one of their readers. Oh, wait - deadpan, not self-deprecating. The Amazon review describes Ms. Kaplan's humor as "deadpan." What the heck does that mean, anyway? Whatever - it's a good book. I'm going to reread it before I have to give it away. And over here, I am just about to hold an exciting drawing to see who will win a copy of Fifty Acres and a Poodle. I've got all the names on pieces of paper and all the pieces of paper are in a plastic baggie (freezer-safe) and now I just have to reach in (no peeking!) and pull one out. Ready? Kari! Kari is another homeschooling mom who has only recently started showing up around here (or else has only recently de-lurked). Her blog is a must-see if you've ever wanted to know how to convert a school bus into an RV. (And, darn it, Kari, it's your fault I can't get the Partridge Family theme song out of my head this evening.) Anyway, they've just painted the bus (not in Partridge Family colors, to my immense disappointment); and it is well worth looking at. Would you believe me if I said I have right here next to me 2 envelopes that I have sworn to address tonight before I allow myself to indulge in the Haagen-Dazs raspberry sorbet that is sitting in my freezer? With any luck, these books might just make it into the mail this week. They've got to, or this book club is going to lose what little credibility it might have. Let's see, where is my pen? There! Envelope addressed (anyone else feel as though they are forgetting how to write longhand? I swear I had to think about how to write an "m") - now I just have to find the book; it's around here somewhere. Produce update: We've baked a double batch of peach cobbler, canned 6 pints of peach jam (with the fruit all floating on the top, which does bother me, still), and have gotten absolutely nowhere with the box of tomatoes, from which is emanating an incredibly foul odor. Weather update: Electricity prices are supposed to rise by about 20 percent starting this month, so I decided to use our air conditioning 20 percent less to make up for the increased cost (yes, I know, I am a real pioneer woman). Unfortunately, temperatures are hitting the 90's this week, with matching levels of humidity. That fact, plus working in the kitchen for hours with a canning kettle steaming on the stove makes me have second thoughts over my new-found frugality. Kid update: Anna's away! ...and the livin' is easy...I'm sorry, I cannot help breaking into song every now and then. It's nice to get a break from all that teen girl stuff - you know, the hair crises and the slumped shoulders and this new thing where she'll answer any question or request with an "Um...okay?" along with wide-open eyes and a slight shake of the head which convey with remarkable economy the sentiment, "Sure I'll do it, even though it is a totally nonsensical request that only a total loser grown-up would make." I've tried imitating it when Larry asks for something, but I can't do it right. It's very subtle. Susie is three. She keeps telling us that. Rachel's tooth is loose. I don't know if it is naturally loose, or if it is loose due to her aggressively wiggling it because she wants the money. Health update: We are all taking turns falling prey to this weird throat virus that lasts forever. One of its more endearing features is that it makes its victim start coughing every time he/she falls asleep. I feel as though I am being tortured. The only thing that will stop the cough is sucking on a Ricola cough lozenge, but then I worry that I will choke to death on it as I sleep. The other night I woke up with a little bit of the lozenge left in my mouth and I thought one of my teeth had fallen out. I got a little hysterical. Otherwise? We're fine. Just fine. Tomorrow - a new book! All of which further convinces me that my plan to encourage my children to elope is a wise one. We bought half a bushel of peaches, half a bushel of nectarines and half a bushel of tomatoes today because I have big plans, folks, big plans. Even as I type, there is a peach cobbler in the oven. Tomorrow, peach preserves! Also, homemade tomato sauce and homemade salsa (I don't want to hear it) - I love summer produce! Oh, and hey - any of you food-preserving mavens out there know how to keep all the pieces of fruit from floating to the top of a jar of preserves? I know there must be some sort of trick to achieving even fruit distribution while canning. I would Google it, but then I land on all sorts of sites warning me about the horrible things that will happen to my loved ones if they eat improperly preserved produce. I don't want to go there. Reminder: leave a comment on Monday's post by this evening to be included in this week's Bloggy Book Club Giveaway. The winner will be announced on Sunday. The winner may even receive his/her prize if they get me their mailing address before 6PM Sunday (that's when my mail courier leaves the state to mail the package from an undisclosed location). Staying incognito is not simple, I tell you. There should be some sort of Blogger Protection Program. I think, tonight, I would like to talk about anything but refrigerators. And Germans. Not that there is anything wrong with either of them. I just need a change. First, a reminder that if you would like a chance to win a copy of Fifty Acres and a Poodle by Jeanne Marie Laskas, please leave a comment on this post by Saturday evening. I may even mail out all these books I've promised to people, one of these days. I'd hate to be accused of blog fraud. That would dash my last hope of Amazon ever giving me a Kindle. David convinced me to visit our garden plot this evening. It was a disheartening sight. We bushwhacked our way in there and found one dead zucchini plant (our last), flowering basil, flowering cilantro, 5 tomato plants doing surprisingly well, and some struggling cukes. The box full of strawberry plants is thriving, though I don't know how. I also don't know what to do with all the runners they are putting out (I type coyly, knowing that at least 16 people will volunteer the proper information)(please?). The marigold plants I threw in the corners of 2 of the boxes are also looking splendid. So, I'm not a total failure. Still, any day now we may receive an eviction notice from the horticulture Nazis who run the community gardening association. From the way people there look at me, you'd think I had built a shantytown on my little plot. I can't imagine what's bugging them, unless it's the piles of old newspapers I put down as a weed barrier. Or the weeds themselves that still cover over a third of the plot. Or perhaps it's the full-length window lying in the middle of the weeds and the newspapers, the one I had meant to make into a cold-frame for my winter crops. People are so picky, aren't they? You know, I was just now going to go off on an amusing tangent about how half the bugs in the world must live in my 400-square-foot plot; and in an effort to garner hard statistics (I'm not an amateur, you know), I Googled "bug population." My friends, do not try this at home. Now I'm itchy. And I can go to bed worrying that Global Warming Could Trigger Insect Population Boom. Like, there isn't one already? 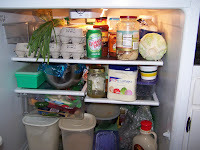 on the au pair website i wrote that your fridge is a prime specimen for an all-american fridge. many future au pairs expect some ken and barbie life with picture perfect everything. well, any american fridge i saw looked like yours so my guess is that THIS IS AMERICA! right there, between the jars of salsa and the pickles and that strange empty space in the upper right corner of the door. Well! I was honored! Yesterday I got to represent America! Me and my little blog! ...this is so american, really! everyone who goes abroad notices how big these [refrigerators] are and they are always, always, always full (unless the head of the house is on some sort of diet). and i strongly believe that you could live out of this thing for a very long time…until you get salmonella poisening or some other disease that makes you puke or poop. so american! so that’s the story. this is a very famous fridge by now, i tell ya! So, now I'm just trying to figure out if it is the puking and pooping that is "so american! ", or the salmonella poisoning. And how did she know about the salmonella poisoning, anyway? I never told anybody. But thanks, franzi, for all the visitors, and for the European perspective on American refrigerator habits! And if you're ever in the neighborhood, make sure to stop by - I'm sure there will be something to eat. Which takes us to Ann, who came in third. Ann? Want some mayo? But now I would like to know why no one mentioned the derivation of yesterday's post title. Can't I have a little appreciation for my creativity here? Slackers. You know, I think I will have a little trouble explaining to Larry why over 40 people are demanding to see pictures of the inside of our refrigerator. [Actually, come to think of it, I'm having a little trouble explaining this phenomenon to myself. The blogosphere is indeed a weird place.] So I'm going to try to post these now, before he comes home and catches me. Here you see the full picture. Try not to take it all in at once - it's a little overwhelming. Next let's get a close-up of the dreaded bins of moldering vegetables. I think the specials this week are cilantro, carrots, and (in the back) an onion or two. Note the gunk behind the bins. I have no idea how that gets there. And, if you look closely, you can see the dirty glass shelves above the bins that are even now making MamaHenClucks sick to her stomach. I warned you not to look, sweetie. Let's see, what else have I got for you? Oh, yes, let's look at the condiments. My family's addiction to condiments, as I mentioned in yesterday's comments, is killing me. Here's the door, where all the condiments (in a normal family, that is) should fit. Do you see the blank space on the top right? What the heck is that for? If I had another shelf there, the situation in the main part of the refrigerator wouldn't be so dire. As it is, the condiments that don't fit on the door are displaced onto the main shelves where they get knocked over and make a mess. Luckily this usually happens way in the back and I can ignore it. Oh, and do make a note of those 2 bottles of wine there on the bottom right. It is possible, MadMad, to have a surfeit of both wine and condiments. Because some of the condiments aren't easily visible (due to being shoved to the far back of our fridge), we end up with even more overcrowding when certain children open a second jar of whatever it is they can't find. 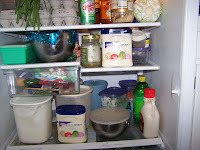 While I was rummaging around in the fridge during this photography session, I discovered 2 full open containers of mayo. Great. I moved both to the front so you can see. 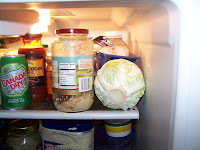 Oh, and see that head of cabbage at the top right? It's not long for this world. I have no idea what it is doing there. Here is a close-up of the top shelf. Please note that big jar of chopt garlic next to the cabbage. It should be on the door. Its present location guarantees that as soon as someone reaches for that chipotle salsa behind the Canada Dry, the garlic will crash to our tile floor. (The only part of my kitchen floor that gets washed regularly is the section directly in front of the refrigerator.) Oh, and check out the jar to the left of the mayo, below the garlic. That's another jar of salsa. And that bowl to the left of the jar? That's homemade salsa. I guess we didn't already have enough in the fridge. Is this making sense? Oh, wait, I just spotted a third jar of salsa (Newman's Own) hiding shyly behind the garlic. Anyone got a craving for Mexican? Now I'm trying to find the picture that shows the huge jar of applesauce shoved all the way to the back of the refrigerator. Hmmm...here it is! See it? All the way back there behind the mushrooms that are sitting on top of the cabbage? What are the odds I'll be able to remove the mushrooms from the refrigerator without knocking over that chopped garlic? Wait...were we talking about applesauce here? Sheesh, I already forgot about it. I don't think refrigerators should be made so deep. So, I hope that little tour made all you blogging voyeurs feel better. Please do not suggest that we invest in a second refrigerator. We already have one. Yup. And it's full. And, no, you're not getting pictures. I've got to draw the line somewhere. I have my pride. Oh, and I have no idea why all you blogging former English majors weren't falling all over yourselves to tell everyone where yesterday's blog post title hailed from. Anyone willing to take a guess? You can win an open jar of mayonnaise. I don't think people understand how even the simplest maintenance tasks can be daunting for those of us less gifted, shall we say, in the arts of housewifery. One of my friends refused to come to the pool with us today, because, as she said, "I have to clean out my refrigerator. It's so full, I can't fit anything else in there." "Can't this wait until later?" I asked. "I hate going to the pool by myself." "No, this is a major job. I have to do it, and I have to do it now." This last was uttered with the grim determination of a fireman heading into a burning building. "Okay," I said, "I've been there. How about you wait until tomorrow and I'll come over for moral support?" [Yes, I am a good friend. The best, in fact...] "I've seen it all, so far as food mismanagement goes. Nothing will surprise me." "No, tomorrow my father-in-law will be here; I can't do it in front of him." Oh, yes, the perils of household mismanagement and its attendant shame! "He'll be sickened by the amount of wasted food. I'm wracked with guilt every time I look in my frig." Who knew that a household appliance could be the source of so much angst? But she's right - there must be a hundred things in my house that scream at me, "You're doing it wrong! What is your problem?!" The piles of unsorted mail on the kitchen hutch, the stray socks and underwear littering the floor in front of the washer and dryer, the laundry basket full of I-don't-know-what that has become a permanent fixture in my bedroom - they all bear silent testament to the fact that, as far as running a household with the calm efficiency of a June Cleaver or a Donna Reed character, I am an utter failure. "You don't understand," my friend continued. "There are strawberries in there so old that they look like they're covered in cream sauce." Silence. Then, the sound of weeping. "Hey, wait a second. Pull yourself together," I begged. "Old food isn't worth this. You went to law school, babe; you can't let this bring you down." "Look," I said, feeling desperate. "I want you to know, you're not alone in this. 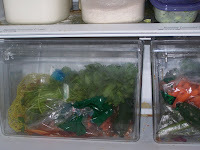 I'm going to take pictures of the inside of my refrigerator and e-mail them to you. It's a sickening sight, but if it would make you feel better..."
"You'd do that for me?" she sniffed. "Hey - what are friends for?" Ha! Bet you didn't think I could finish another book in just a week and still keep up with my blogging addiction, did you? You folks don't know who you are dealing with. Of course, not being able to sleep for the past week provided me with some extra reading time. Seems that every time I manage to doze off, I can snooze for only 15 minutes before I rouse myself with a hacking cough. And when I'm not coughing, Susie is. Fun times! Bah! Who needs sleep? Not me! Instead of sleeping, I read Fifty Acres And A Poodle by Jeanne Marie Laskas. It is a funny and well-written true story of how she and her boyfriend/fiance, both urban dwellers, buy an honest-to-goodness farm as part of a sort of midlife crisis. She maintains a charmingly self-deprecating tone throughout most of the book (look at us stupid city slickers! ), while providing thought-provoking descriptions of the sort of folk one doesn't generally run into in Starbuck's; people, that is, who drive tractors and raise sheep and go hunting. While Ms. Laskas is an amusing writer who can tell a good tale (and really, it was hard for me to put the book down), she is also an exceedingly self-referential one. If you are someone (like me) who got married and started having kids in your 20's, there is something vaguely disorienting listening to an almost middle-aged person be so wrapped up in what she is thinking and feeling about herself. People who don't have kids, it seems, have so many issues. No, no, that's not right. We all have issues. But people without kids have time to think about those issues. All I think about is where my next good night of sleep is coming from and who the heck is driving the girls to flute camp in the morning. Oh, and blogging. I think about blogging. In fact (and I am embarrassed to admit this), I dream about blogging. So maybe it would be healthier for me to be talking about my own personality issues, as Ms. Laskas does, rather than to be obsessed with people I have never even met; but, truth to tell, other people are much more interesting than I am. So I'll stick to being shallow and non-introspective. So, anyway, whoever is interested in reading this book next, please tell me so in the comments. I will hold a drawing on Sunday to determine the winner. Remember, if you win the book, you need to read it, talk about it a little in your blog (and really, no matter what you say, it has got to sound more intelligent than the blather I come up with), and then give it to someone else to read and comment on. Fun, right? Sort of? That didn't sound right. I've got to work on this. Anyway, be sure to stop by her blog and congratulate her and beg for the opportunity to be the next to read Why I'm Like This by Cynthia Kaplan. Because remember, people, those are the rules - if you win the book, you read it, review it, and hold a drawing to choose the next person to read it. As if all this excitement weren't enough, I am posting today over at MidCenturyModernMoms about why moms of teens can be such depressing bloggers and how Xtreme Parenting: Teen Edition can fix all that. See you there! Today, I present to you one e-book you'll never find me downloading. That's okay, I'll tell you. It's an e-book for parents who struggle "with the difficult decision of picking the right preschool for their child." That's right, folks! This book is chockfull (sp?) of checklists, worksheets, and planners that promise to enable you to find the right child-family-preschool fit. Also included: handy tips for navigating that tricky admissions process! Whew! That's a far cry from our method of preschool selection. Essentially, Larry and I have only 2 criteria: location (Less than 3 miles from our house? Check!) and affordability (can we still feed everybody? Barely. Check!). While it has never fit well into our family's budget (particularly the type with waiting lists and acceptance letters), there have been 2 times in our 16 years of parenting that Larry and I felt that some preschool might not be a bad idea. The first was when David was 4 and lay on the sofa talking to himself all day. Brian was only a toddler at the time, too young to really play with; and David had no friends who were boys. His loneliness and his weird behavior worried us (think Unabomber, okay? because we certainly were); so we sent him off 2 days a week to make some friends of the masculine persuasion and to stay out of my hair for a few hours. Imagine our dismay upon hearing from a happy David after each (expensive) (for us) preschool session, "I played with Lizzie, and Sarah, and Hailey." Money well-spent, eh? But it did keep him busy, and he seemed to babble a little less when he was home alone; and by the next year Brian was old enough to be his playmate, so we were able to stop paying the big bucks for David to make more girlfriends. We found ourselves knocking on this same preschool's doors 5 years later, however, with Rachel in tow. You know, Rachel - the 4-year-old of plumbing and taxidermy fame. We had a few qualms about dumping her for 4 days a week on her unsuspecting teachers (and Grandpa had to help us out with the tuition); but we were desperate to find something, anything, to distract her from the mischievous housewrecking in which she had been engaging. So there you are: no checklists, no worksheets, just a simple "Here's our child, feed her a snack, here's all our money to sweeten the deal" transaction that bought me some much-needed hours of guilt-free peace and quiet. Preschool, if you can afford it, is a wonderful creation, something invented with a mother's sanity in mind. If your child learns something (other than how to burp at snack), great! If he doesn't, who cares? It ain't Harvard. And it definitely shouldn't cost as much. Anna opted, once again, to stay home and hang with her best friend's family for the day. We wasted no energy cajoling her to join us, as her staying home meant we wouldn't have to take 2 cars and thereby saved us about 60 dollars in gas money. Sometimes an alienated teen can be a useful thing to have. Also, her staying home meant that she wasn't sitting with us all day, dementor-like, sucking away any enjoyment we might be deriving from watching the younger ones frolic in the sand and surf. So we packed up the 2 boogie boards, and the cooler full of food, and the 2 cute little beach chairs I got for the girls for only 5 dollars each; and we didn't pack the beach umbrella, which had mysteriously disappeared since last year, and we set off in search of some summer fun. I knitted all the way there, which was nice, even if I did have a sore throat, and laryngitis, and was sleep-deprived because either Susie or I kept waking up coughing for the previous 2 nights. But no problem, really. We even remembered to bring Larry's new kite. I've mentioned before how flying kites isn't Larry's strong suit, but how he nevertheless persists in his dream of finally getting one of these contraptions aloft. As I am the sort of wife that believes in encouraging her husband in his aspirations, I gave him a real kite (as in, it cost more than 3 dollars and didn't come from Target) for Father's Day. He and the kids were sure that this would finally be the day that they would enjoy the family-bonding experience of kite-flying at the beach. You know I'm giving it this build-up for a reason, right? According to the company we bought the kite from, the kite we purchased is perfect for beginners and foolproof to fly. Foolproof, my a**. You'd think the thing was made of lead, the way it insisted on hugging the ground. So now I hate the kite people for lying to me. You would, too, if you had to stand there for half an hour watching your 11-year-old son attempt to make this thing take the air; and then watch him cry when he couldn't do it. I made elaborate plans to return the purported flying apparatus with an irate note for the prevaricators in the catalog-writing department; but then Larry effectively put the kibosh on that idea by accidentally breaking the kite while packing up the van later. As far as flying kites goes, my spouse is still the Charlie Browniest. Other than the kite-flying debacle, however, the day was great. We took a zillion pictures, Susie looked extremely cute napping in her new little chair, and I was happy not to be home feeling as though I should be cleaning something. I would say the beach was wall-to-wall people, only beaches don't have walls. Let's just say it was super crowded with great masses of humanity; and I can't help feeling that, after spending a day observing these great masses, there should be some sort of rules on just who, exactly, is allowed to wear a bikini. We stopped at Burger King for dinner on the way back, just to make our beach vacation complete. And then I came home to lots of comments on my post about business executives feeling the pinch. Maybe I should send in some low-cost vacation ideas to the WSJ. Do you think their readers know to order from the Dollar Menu? On Monday, the Wall Street Journal ran one of those "little things you can do to save money in these hard times" articles. Apparently, the people who are supposed to be running the economy - the movers and the shakers, if you will, the Wall Street Journal readers, the businessmen - do not know the most basic math; because, if they did, they wouldn't need these economic helpful hints. I mean, gosh, did you realize it is cheaper to rent a video from Blockbuster than to go out to the movies? Congratulations! Apparently you are smarter than the average WSJ reader. Oh, and number 3 on the list says to make your coffee at home instead of buying it at Starbuck's. Yup, it's actually cheaper that way. Who woulda thunk it? Not, apparently, the upper-middle-class executive types who read the Wall Street Journal and who have a hand in running some of America's biggest corporations. And, yo! all you welfare queens, if you would just stop getting that weekly manicure, you, too, could save over 500 dollars a year! So stop whining about not being able to afford dental insurance for your kids and buff your nails yourself. It's what all the rich folk are doing now. It's hip to be poor. Read the rest of the article yourself. It's making me sick. I didn't realize just how tough these economic hard times have been on our captains of industry. I mean, how's a hard-charging exec supposed to feel, drinking out of the communal water cooler rather than bringing his own private bottle of spring water? How is he supposed to concentrate on his job of bolstering the American economy when he is experiencing such cataclysmic changes in his own lifestyle? It can be part of a grand new initiative - No Executive Left Behind. Because a high salary is a terrible thing to waste. Forgive my crankiness yesterday - I was coming down with something, is my excuse. So today? Even more cranky. I do hate being sick. Anyone else have this problem that, when you're sick, everything - as in, say, your entire life - seems horrible and hopeless? It's like looking at the world through vomit-colored glasses. Susie's still sick, also. But mostly at night. Because we wouldn't want to get a decent night's sleep, right? I feel fat, too. That's not helping my mood. And have I mentioned the ants? They're back. Maybe I'll do all short paragraphs today. In honor of BlogHer. Which I am sure would be really fun if I actually went to it. And I do like mamabird. I'm glad she can take a joke. But I still wish she had given me her plane ticket. Except I would have been too sick to go anyway. So there. Alas, the humor well is dry today. Nothing funny. Nothing even halfway amusing. So why am I here? See? Being sick depresses me. Someone tell me something funny. Anything. Laughter's the best medicine. Or that's what I read in the Reader's Digest, anyway. Why am I quoting Reader's Digest? I hate them. They never want to buy my jokes. I've been trying to get their attention ever since I was in the 6th grade and I spotted "Our ryes have seen the glory..." on a poster in a Jewish deli. I sent that in, and they never even answered me. I'm gonna go listen to the Brian Regan Live CD that Suzy recommended. I bet the Reader's Digest never took any of his jokes, either. Um, not to sound jealous or anything, but...could y'all just shut up about the great time you are going to have at a certain bloggers' conference in a certain fun city? Enough, already. And, while you're at it, please don't spend time bemoaning leaving the kids behind while you attend (mamabird, I'm talking to you!). Just mail your plane ticket to me if you're that torn up about neglecting your motherly duties. I neglect my motherly duties all the time, anyway. I might as well have some real fun while I'm at it. I'm starting my very own blogging book club. It will be simple, really. I'll read a book, then I will comment on it and give it away. The person who gets it must promise to do the same. (I have no idea how I will enforce that, of course.) I need some incentive to read something decent, because - really - my brain is rotting away from the inside out. I can feel it. I mean, if I see a blog post with paragraphs more than 5 sentences long and/or no pictures, I skip it 'cause it looks too hard. That is a very bad sign, indeed. Hence, the fun of a giveaway. Granted, I still haven't mailed the first book I gave away; but I promise I will develop a better system. Maybe. So! I would like to start this giveaway with The Devil in the Details (Jennifer Traig); but I can't, because my best friend (hello?! are you reading this?) still has it. Until she decides to pretend that she is still literate and finish reading it, I will have to focus on other books I have read (because I've read about 3 other books since that one, not that my friend is slow or anything...). Instead, I give you Cynthia Kaplan's Why I'm Like This. Her self-deprecating, somewhat neurotic style is a refreshing contrast to what one would assume to be the self-aggrandizing personality of a New York actress/writer. Cynthia never fails to surprise the reader with a fresh take on typical life situations, leaving him/her with a new appreciation for the mundane. How did that sound? I've been reading a lot of Amazon book reviews, and I think I'm channeling them. Because, truth to tell, no matter how much I like a book, I always end up at a loss for words when I try to explain it to other people. I say things like, "Well, um, it's about this woman who is also an actress, but she's not really like that, she's sort of a regular person, too." Or, "It's about this person who grew up sort of Jewish in Connecticut and who lives in NYC, but it's really funny." Or, "I really liked this book because....hmm...I guess I identified with the author, even though we have absolutely nothing in common." In other news, I have won the much-coveted (by me) Imperfect Parent Blogger award. Unfortunately, I have no idea what the prize is, other than that it is - in the words of the people running the contest - "unique." Frankly, I don't want unique; I want an Amazon gift card. So there may be another giveaway in the offing here. I'll keep you posted. Poor Susie keeps jerking awake, saying that her ears hurt. We've already pinned her down and forced Motrin into her, but it doesn't seem to have made any difference (aside from traumatizing me). This situation does not bode well for the rest of our weekend. The illness seems to have come on rather suddenly, as just today Susie (along with Rachel) was a happy attendee at a birthday party which featured The Reptile Lady. I know that sounds like someone who belongs in a circus sideshow (Step right up! See the Bearded Dragon Lady! ), but in actuality it was a very personable young woman who arrived at the birthday girl's house with various ugly creatures in tow. These included a bearded dragon, 3 snakes (including a boa constrictor), and a tortoise. I, for one, was completely grossed out (well, except by the lizard - he was sort of cute). Oh, and Rachel is now the proud owner of a stuffed iguana, awarded for her prowess at Pin the Tail on the Donkey. I hope she didn't cheat. I also hope she doesn't cut its head off. I chose to hang out at the party with the girls, because the alternative was to stay at home and watch Larry tug huge pieces of flagstone all over our backyard in the 90-plus degree heat. In fact, before the party, I was so desperate to get away that I took the kids on a walk to get a free smoothie at a Grand Opening about a mile from us. I figured we'd be the only people in our rather affluent town to be cheap enough to care about a free 12-ounce drink. Apparently, however, the economic downturn is taking its toll; we arrived to find we were 101st in the line waiting for the store to open. I know we were just past 100, because they ran out of free T-shirts just before we got to the door. They were good smoothies, though. Well, that's all the news fit to blog for today (and then some); pop on over to MidCenturyModernMoms if you care to find out what the cardinal rule for raising teenagers might be. Or don't. Whatever. I think I've bothered people enough this week. I know from reading your post from June 27th, "A Willy Wonka Nightmare," that you are interested in Mars, Incorporated, IBM and the USDA-ARS's plan to sequence the cocoa genome. If you still have questions about the project, I hope you will consider attending a conference call taking place this Wednesday afternoon, July 16th, with Dr. Howard-Yana Shapiro, Ph.D., global director of plant science for Mars, Incorporated. Dr. Shapiro will be taking questions from bloggers interested in Mars' work with the cocoa genome. Please let me know if you are interested in attending. Call details will be circulated to those interested as soon as they are available. Have I told you that I am a truly excellent driver? Have I mentioned that I have had no driving mishaps in, oh, 27 years (aside from one speeding ticket - I was going a whopping 44 mph at the time). Because I've just realized that some of you might be getting the wrong idea about me - let's face it, first I'm stopped by an MP for reckless driving; then, I sideswipe someone in a parking lot. And, then, well...there's what happened today. You see, today I managed to put a hole the size of a golf ball in the sidewall of my tire. I know, it's pretty difficult to do, especially when you are only driving about 5 mph; but it may have something to do with the curb I ran into. I mean, who knew that storm drains were so sharp on the corners? Luckily, I was in the middle of pulling into my parking space at home, because the tire went flat in about 2.4 seconds. Whoosh! The kids thought it was really cool. So did Larry, when he came home from a long day at work and discovered he had some automotive repair to do. Larry says he isn't upset; but when he dropped off the van at the garage this evening, he insisted I come with him so we could enjoy a pleasant stroll back to our house, right through coyote territory. Have I mentioned he has a life insurance policy on me? Do you think he feels it's time to cash in, or what? I mean, I'm getting sort of expensive. We did take advantage of the situation to show Theo how to change a tire on a car. Really, that should be required knowledge before we let the teens get their licenses, anyway. So, as I pointed out to Larry, it was sort of good that this happened. Plus, it gave me something to blog about today that didn't involve voting for me. I guess he didn't agree, because he wouldn't let me take a picture of the hole in the tire. You'll have to take my word for it, it was really impressive - almost a perfect circle. In other news, I went back to the expensive library today and paid them 20 dollars just so we could check out a few more books. I thought libraries were supposed to be free. What's up with that? I would have gone to the library that doesn't do fines, but my account there is "blocked" until we find the 2 missing Asterix books that the boys swear we don't have anymore. The librarian there suggested that I take out another library card in one of the kids' names and use that, but I knew better. That would be the road to perdition. I sound like a loser, don't I? A crazy-driving, book-stealing, irresponsible loser. If our teens were doing all this, Larry and I would be all over them. For sure, they would be grounded. But, hey, that's a good idea! Someone send me to my room for a week. I promise, I won't come out. P.S. Did I mention that y'all can vote for me again today? P.P.S. Did you notice how clever that was? I put it in the "P.S." part, just like Sue does. Hey, I can be all cool and nonchalant too, ya know. Remember in high school, when a friend says you should have a party and invite all the kids who won't give you the time of day and then maybe they'll realize how cool you are and be your friend? So you do it, and "they" all show up and act really obnoxious and eat all the food and then they leave and they don't talk to you the next day in school? And you feel lousy, and your mother keeps making it worse by trying to act all nice and asking who everyone was and all? No? Oh. Well, then, never mind that. But, look. I'm a little upset. Here you've got your millions of readers heading on over here and tramping all over the place - I mean, can't they even take their shoes off first? -and they're reading all the goodies and not even bothering to leave any comments, and then...then!...they outclick over to the voting page, where they are all voting for you. But, hey, none of that matters. You see, my readers, the ones who come here all the time and even bother to say hi every once in a while, I know that they will bother to take the time today and tomorrow to go here and vote for me. Because I'm worth it. Or, at least, that one post of mine was worth it. And even if it wasn't, they'll do it anyway. Because otherwise, people like Sue will just take over the world - people who run off with some sleazy (sp?) city, just to go crawling back home a few months later. And no one says anything! No one says, "Gee, Sue, you're lucky Utah took you back," or "Gosh, Sue, been to Vegas lately (wink, wink)?" Noooo, it's all "Yea, Sue!" "Great to see ya, Sue!" It's sickening. And yeah, I know I'm begging. I'm not even being subtle like you, Miss Ten Thousand Million Readers, by just putting it in the "P.S." part of your post, as if, oh yeah, I almost forgot, could you do this for me? As if! You know you want it. And you know what? Even if I don't win, I was winning until you got your Internet back. And I'll always have that. Even if you are funnier than me, and more popular than me, you and your friends can't take that away from me. P.S. Vote for me, again, will ya? She's kicking my a**. P.P.S. Click on the "sleazy city" link up there - I hate to admit it, but Sue's hilarious. P.P.P.S. But vote for me anyway. That's not the post that she's competing with, thank goodness. I'm winning, but if Sue gets her internet access back before the 11th, I'm in trouble. She'll order her hordes of faithful readers over there to vote for her, and my lead will melt away faster than a snowball in heck. Because Sue, you know, does have that sort of evil power over her blog-reading minions. So don't stop voting! 3 more days! Anna's been sick. Double outer-ear infection. Doctor gave her drops last night, but then she took a turn for the worse. Woke me up at 5:30 AM. Called me sobbing at the pool this afternoon, in utter pain, feverish, etc. Larry left work early to take her to urgent care. Got numbing drops, more meds, etc. And as soon as that pain (which I do realize is excruciating) stopped, whaddaya think...? "Aren't you driving me to ensemble practice tonight?" "Um, 2 hours ago, you were writhing in pain. You have a fever. You are, in fact, very sick. So...no. We're not." A look, in fact, that goads me to say, "Did you thank your father for taking you to the doctor?" Another "what's the big deal?" look. Then, "Noooo...." in that slow, drawn-out, "why are you asking me that?" tone that most teens have polished to perfection. I can't resist. For some reason, I need some confirmation that what we had all just experienced was real. I need to try to connect with the girl that I want to believe is still in there, the one I had a glimpse of this afternoon when she was in pain and needed us. "Because, remember? Your ears really hurt, you were crying, and Daddy came home early just to help you?" That question earned me the coup de grace, the Look that says, "So?" Yeah, I was asking for that one. Okay, I give up. The medications are there on the counter, so it must have happened; but today, for me, was just a cruel tease. Anna has gone away again, to wherever it is all loving girls go when they turn 13. You know, I was a teenage girl once. And I do remember that "I don't need you, I'm not a little girl anymore" feeling. In fact, I even recall the "I can't believe I'm related to you people, it disgusts me that I still require your assistance at times" attitude. But, as a parent, I also have fond memories of a sweet young lady that liked to talk to me, a girl who didn't look disappointed every time she walked into a room and saw me there. I remember a girl for whom each day was a present waiting to be opened, for whom each hour there was a reason to laugh. Hey, Anna, we miss your love. We miss your sunniness. We miss everything. Maraiya commented yesterday only to ask if I have thrown up yet. Sorry to disappoint all you vomit voyeurs out there, but it seems Brian's puking episode on the 4th stemmed from simple overconsumption of holiday goodies. Nothing contagious, thank goodness. I don't think I'll be eating cherry pie any time soon, however. Yuck. Oh, and today Holly, over at June Cleaver Nirvana, gave me an award for making vomit "the new black." Boy, I wish I had thought of that line. I don't really understand the award itself - it's called Arte y Pico, which I think is some sort of salsa. I can't wait to try it. It seems that there is yet another stumbling block to my being anointed the Imperfect Blogger of the Month. Here I was keeping an eye on Sue , while all the while MadMad has pulled even with me in the voting; and she hasn't been abasing herself by begging her readers for votes, even. 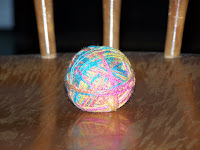 I had assumed that her post, although laugh-inducing (as is everything she writes), was way too knitting-oriented to tickle the average non-knitting parent's funny bone. Apparently, I was wrong. Hey! Maybe it was you all who voted for her. Now I don't know whether to urge the stragglers to get on over there and vote (every day until the 11th!) or not. I found the following assertion (well, warning, really) in this column, which interviewed a priest on marriage advice. People are the same after marriage as before, only more so. Pretty astute for someone who has never been married, no? He meant it in the sense that you can't change someone by marrying them (i.e., someone who drinks too much before marriage will drink too much after marriage too). But it occurs to me that this statement is also true in the sense that whatever attracts you to a person in the first place, has the potential to drive you crazy after a while. The boyfriend who is so steady and dependable? Becomes boring. The guy with the great sense of humor? Turns out he can never be serious. One of the things that attracted me to Larry was that he was so nice to everyone he met. Now it often irritates me that he gives everyone the benefit of the doubt. Dammit, can't he be just a little critical? I'm sure this works the same way for guys, too. The bubbly girlfriend who could hold up her end of the conversation and always had something fun to say? Turns into the wife who just doesn't shut up. The independent, take-charge career woman? Changes to a control freak - can't she ever let her husband make the plans instead? You know, people mention the 50 percent divorce rate and shake their heads in dismay; but, to my mind, it's amazing that half of all marriages succeed. Have no fear, though; Larry's and mine will be one of the successful ones. I'm pretty sure that - no matter how much we might irritate one another at times (um, hypothetically speaking, of course), and regardless of what rough spots we might have to navigate in the course of lifelong matrimony - neither of us will be anxious to just bail out. For we have a deal, you see: should one of us decide that the marriage is over? He/she will receive full, unhampered custody of all six kids. Gives a whole new meaning to the phrase "Quitters never win," doesn't it? My point being, Larry and I are living history nuts; and the children have been made to suffer accordingly. I have been nominated as the "Imperfect Blogger of the Week" for the last week of June. Imagine that - just because I couldn't recognize my own child at the pool. I was sort of excited, at first, because every month they have readers vote for the most Imperfect Blogger of the Week and I figured that no one could beat a story like mine. That is, until I saw that this post of Sue's had also been nominated in June. So, I was going to beg everyone to go over and vote for me (hurry! ), because I think there might be a real prize available; but now I'm just going to have to tell y'all to head on over there and vote your funny bone. That's the only honest thing I can do when I am up against the blogger who makes me laugh every single time she posts. And she's had a rough 6 months. And she's in the middle of moving again. Plus, hers was pretty funny. Damn. I hope everyone had a glorious (and wormless) Fourth! Dawn posted about her husband and kids finding mulberries on the trees near their campsite, which reminded me of my own mulberry story (don't you have one, too?). It's a story of birthdays, and self-sufficiency, and disillusionment, all rolled into one. You see, mulberries are ripe here at the same time as David's birthday; so, many years ago, when he was a baby, Theo and Anna and I picked some and saved them for a couple of days so we could use them to color the frosting for David's cake. I was crowing with pride over my resourcefulness as we mashed the hand-picked wild berries (free! not artificial! Just like the pioneers!) into our all-natural confectioner's-sugar frosting - yes, I was practically overcome with the ingenuity of it all, until I noticed several minuscule worms (worms!) (teeny-tiny worms!) crawling in the bowl. This discovery would not have been quite so traumatic had I not had a spoonful of said frosting in my mouth at the time. Alas! This occurred in the dark ages before blogging and before digital cameras, or I most certainly would have gotten a picture of that frosting, in all its freshly-hatched larval glory. After I had stopped gagging and spitting and generally retching into the kitchen sink, that is....which scene was probably photo-worthy itself. So, have a great Fourth, y'all! Just make sure to look at your food before you eat it, okay? This, my friends, is what I did this evening. I finished my sock. I mean, I finished off my sock. This is what remains of Attempt #3 to knit myself some cute cotton/wool socks out of honest-to-goodness Sockotta sock yarn (avid readers of this blog - if there are any - will note that the yarn color is eerily similar to that of the shoes that changed my life). Lord knows, I am not a knitting perfectionist like a certain famous knitter whose blog I read; so I cannot for the life of me figure out why I keep ripping this poor sock back and re-doing it (the second time, I actually had it Kitchener-ed, and I still ripped it back). But here we go, for the fourth (and hopefully last) time. Okay, got that off my chest - whew! In other news, Anna is annoyed at me. I bought her a file box and some folders and she said, "Oh, I don't need that!" And I said, "Yes, you do - look at all these loose papers lying on the floor of your room and filling your closet." And she said, "Oh, that's just trash." And I said, "Oh, never mind then. Just leave them." Just kidding - apparently, that's what I should have said. Instead I described to her the amazing holding properties of a trash bag and instructed her to use one immediately. Because obviously she had never seen one before. The day sort of went downhill from there. David is at Boy Scout camp until Saturday. Which means I have 2 and a half more days to purge all the crap from his closet. Wish me luck. "Here?" Larry said. "Next to this very large tree in a lightning storm?" "Yeah, why not? It's dry here." A slight pause. Then, from Larry, "You know, I'm beginning to see how natural selection works." Water gun fights - you can buy decent SuperSoakers for 5 dollars each at Target or KMart, which toys will provide your kids with at least an hour of outdoor fun per use (just make sure to lock the door behind them so they can't sneak back inside too soon). Then they spend another half hour fighting over who puts the hose away. Bonus! Blanket tents and pillow fights - strip all the kids' beds and pile the comforters and pillows neatly on the floor of one of the bedrooms. Tell them not to mess it up (this step is important - it renders the pile irresistible). Leave. Knit for half an hour until someone bonks their head on the side of the dresser. Food - McDonald's has one-dollar sundaes. Why not? Walks - Yeah, it's hot, but it wears them out. By the time you get home from the trek, they lie around the living room, too tired to fight. Remember hydration. Science experiments - Have each kid use a natural mosquito repellent on the right arm and DEET on the left arm. Send them outside for half an hour (again, lock door). When they come in, have them count the bites on each arm. Discuss your results. Remember, if you don't wear them out, they will wear you out. If all else fails, keep the kids busy doing any chores you can think of, until they run away and hide. As always, the best defense is a good offense.